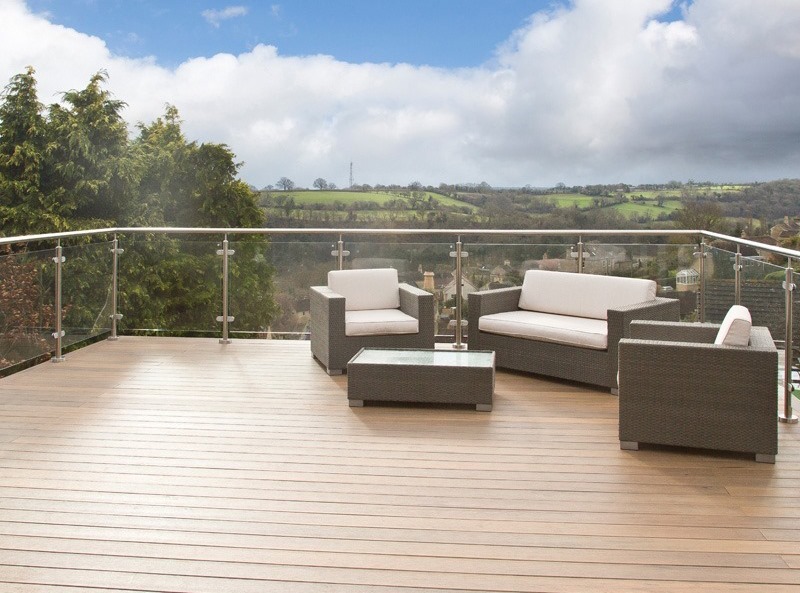 If you’re looking for a beautiful decking product that can stand up to the elements, we’d heartily recommend EasyClean Legacy Tigerwood capped decking. This beautiful design is a fabulous addition to the TimberTech range, combining the striking appearance of genuine tigerwood with the no-nonsense durability of composite wood. 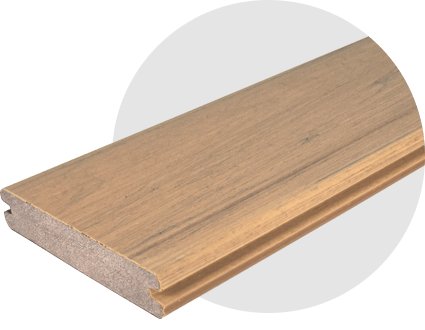 These boards are slip-resistant, warp-resistant, fade-resistant and splinter-free; they barely need any maintenance whatsoever! Tigerwood is a common name for several different types of tropical wood, but they all have a similar appearance: bold, dark stripes on a slightly lighter background. 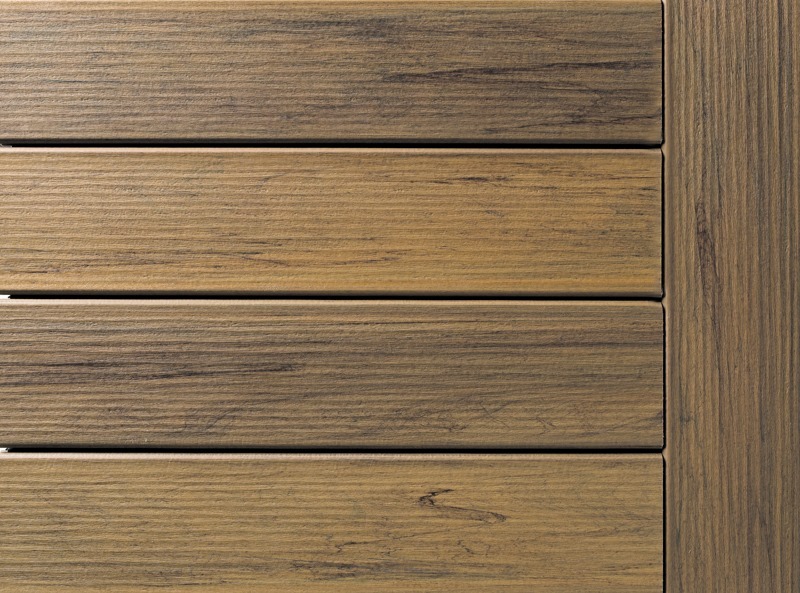 This creates a very arresting effect – no wonder our Tigerwood decking is so heavily sought-after! EasyClean Legacy deck boards have a variegated design, emulating the colour variation of tropical hardwood. However, this is not always made apparent by the small section of decking that we send out to customers who request free samples; for this reason, we recommend visiting the EasyClean Legacy photo gallery to get a better impression of what this product looks like once installed. 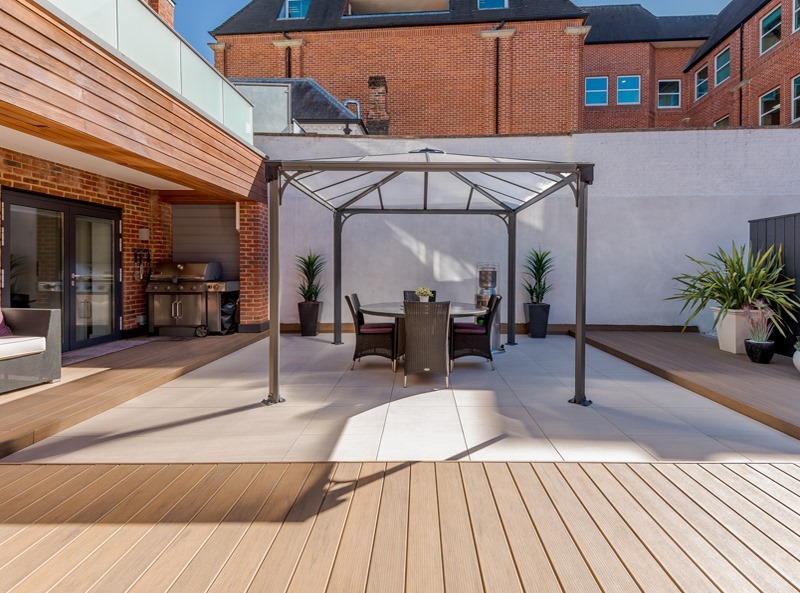 If you are interested in using our Tigerwood decking in your outdoor space, give us a call on 029 2080 3756 or email info@timbertechuk.co.uk to request a quote for your project. 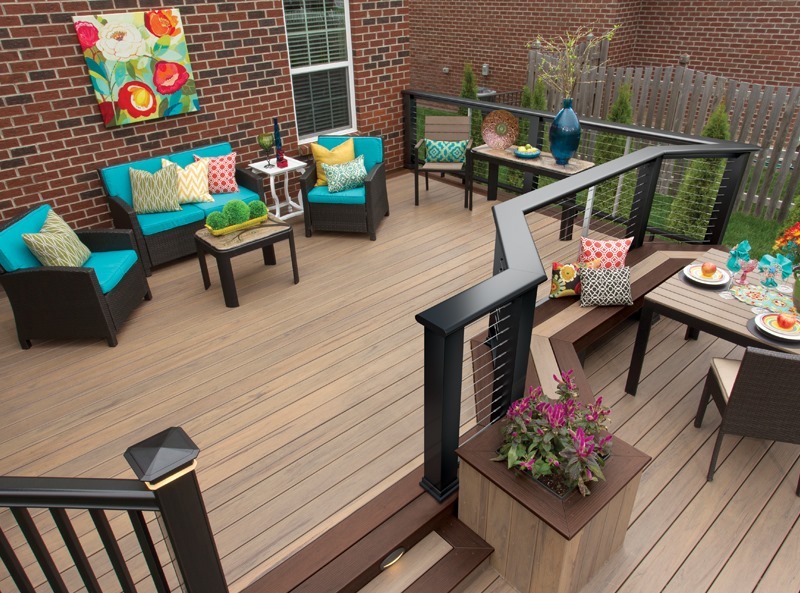 Bear in mind that we also offer a variety of decking accessories, such as glass balustrades, handrails, and deck lights. "For several years we have been trying to come up with a plan for making our flat roof above the double garage into the ‘wow! Factor’ it deserved. It has spectacular views down to the houses of the Bradford on Avon Valley and a panoramic view of the distant Westbury White Horse and further across the plains towards Salisbury. The old surrounding rails were in a very poor condition, as was the old loose chipping surface of the main roof. We hardly ever used the area, other than to water the plants in troughs. After several attempts of getting estimates from different company’s without getting all we were after, I contacted TimberTech and requested the samples. I then talked through my ideas and thoughts with the very helpful Melissa who went through possible costs, ideas etc. and with the help of a few photo’s sent, and various e-mails, a designer called at the property and designed exactly what the roof needed. It was a big project as it included a glass Balustrade surround, plus steps to the lower patio area. This of course all took time to complete but we are absolutely delighted with the completed effect. This improvement definitely increases our enjoyment of the outdoor space and surrounding view. It also will enhance and increase the sale ability of our property. Many thanks to Melissa and all the team of workers. "